Adapting fringe patterns for structured light machine vision applications is an essential capability of advanced machine vision systems. Specular reflections from shiny objects and variations in illumination uniformity can negatively measurements. In a DLP-based machine vision application this dynamic adaptation implies taking advantage of pixel level control of the patterns. Early DLP machine vision solutions support only canned patterns and you’re limited with regards to the kinds of patterns that you can display on your objects. Preferable would be a system that allows you to not only create your own patterns but also dynamically adapt those patterns based on a real-time feedback loop in the system illumination/capture subsystem. For example, in the Keynote Photonics FlexLight X3 system, you can provide an adaptive mask (gain coefficient) using one of the HDMI inputs. The HDMI image in effect becomes a map of gain coefficients, each pixel representing the gain to apply to each pixel generated by the internal X3 pattern generator. Fundamentally, all structured light machine visions systems use a lighting or illumination source to project a series of patterns on an object under study. Cameras are then used to detect the distortions of the known patterns and thereby analyze and reproduce a representation of the object under study. Depending on the software used to process the captured images, the number of repetitive of patterns needed to re-create an image of the object will vary. The resultant image is compared against the baseline and any differences can be detected and acted upon by the system. The speed of any machine vision system is driven by 2 major subsystems – the illumination / capture system and the backend processing of the captured images. The speed at which the structured lighting patterns can be projected onto the object combined with the speed at which a synchronized camera can capture those images defines the speed of the 1st element. The 2nd element is simply a matter of the image processing power in conjunction with the buffering of the images to reduce bottlenecks. Another key attribute that simplifies machine vision system design is the ability to customize the opto-mechanical design of the illumination source to fit existing systems or new systems where layout space or other constraints benefit from added flexibility. To address these system attributes the FlexLight X3 operates at high speed and provides 2 camera sync signals and an on-board frame buffer. 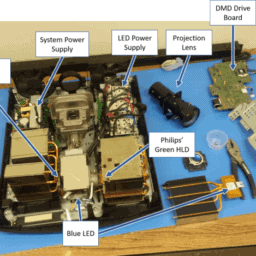 The X3 machine vision solution also separates the DMD board from the other system electronics using a flex cable. This allows system designers to create the optimum partition between their optics, their light sources ( LED, lamp or laser) and the system electronics.